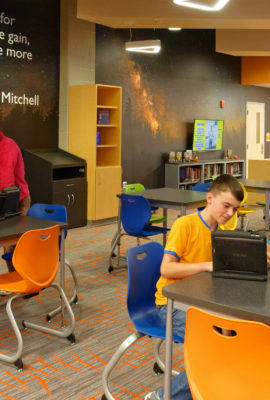 Shepard Middle School’s transformed science labs provide students with 16 cutting-edge environments for experimentation, small group work, traditional study and outdoor exploration. 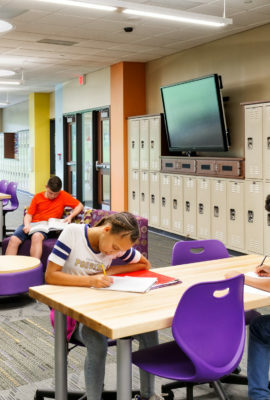 When the State of Illinois Board of Education adopted Next Generation Science Standards (NGSS), Deerfield 109 took proactive steps to support new ways of teaching and learning for their students. 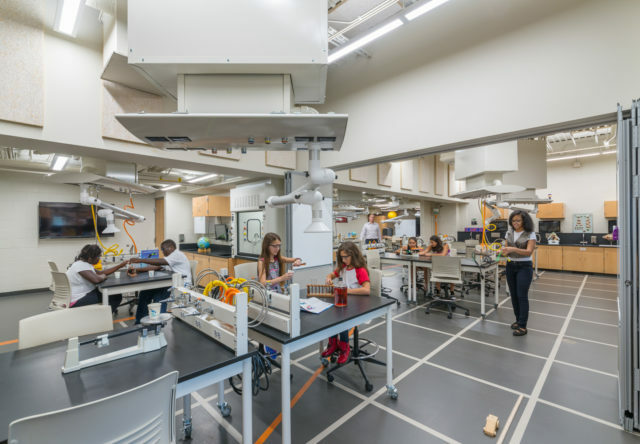 Fanning Howey designed the renovation of four traditional science labs to embrace these forward-thinking concepts in every possible way. 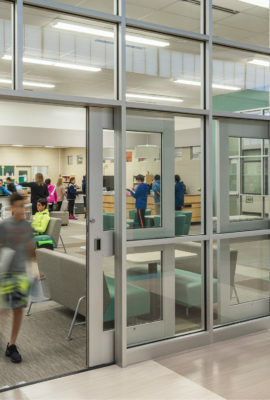 The built environment incorporates design elements specific to NGSS, allowing students to explore science concepts through flooring patterns, wall graphics, glass block walls and on-site renewable energy sources. 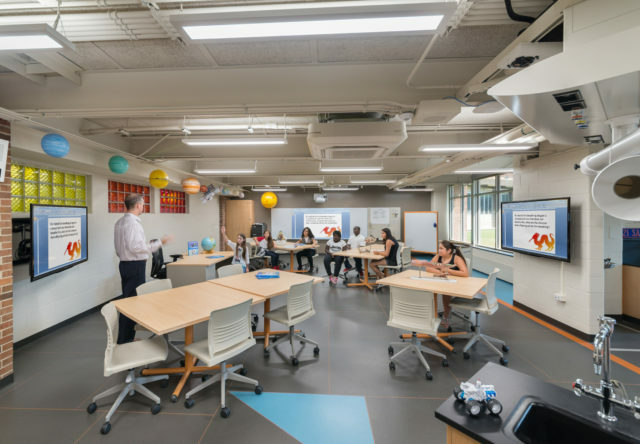 Innovative STEM labs give students an immersive environment for experimentation and hands-on learning, with breakout spaces in the hallways to allow collaboration to happen anywhere. 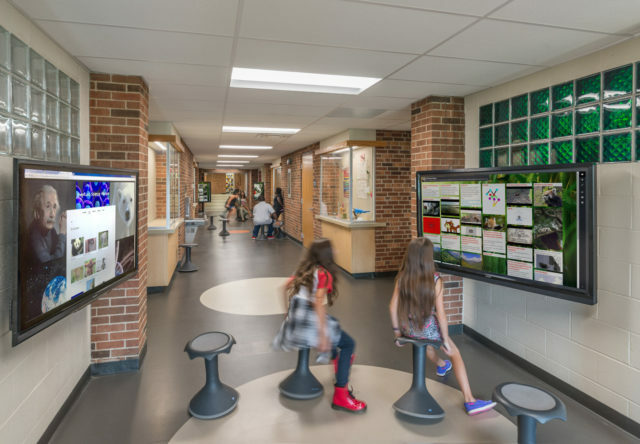 Wind turbines, solar arrays, geothermal systems and other sustainable design elements are used as sources for project-based information and teach valuable lessons about sustainability. 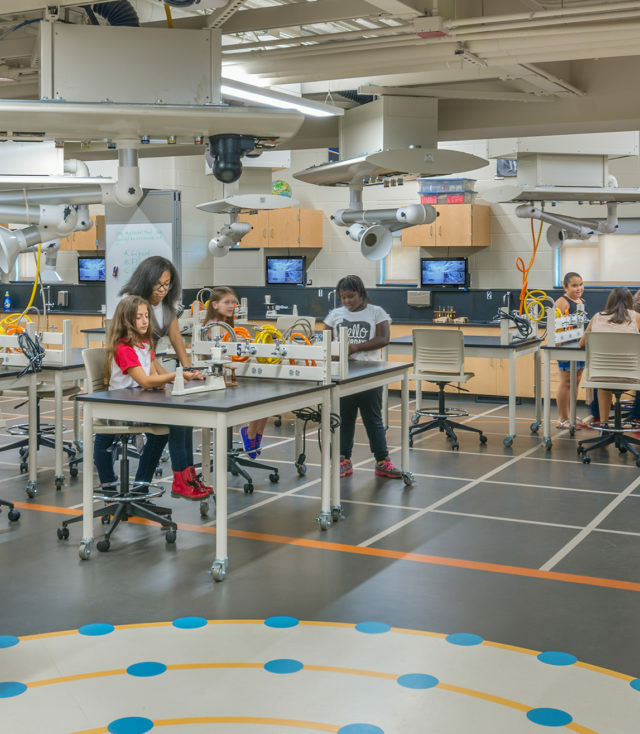 Innovative STEM labs give students an immersive environment for experimentation and hands-on learning. 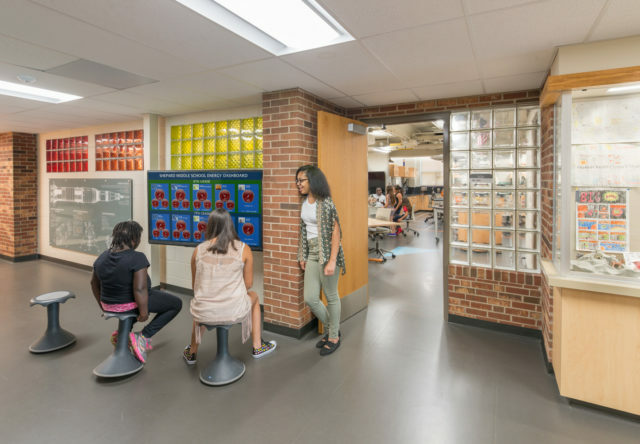 The built environment incorporates design elements specific to NGSS, allowing students to explore science concepts through flooring patterns, wall graphics, glass block walls and on-site renewable energy sources. 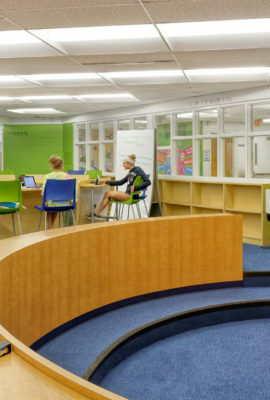 Collaborative breakout spaces in the hallways of the school utilize space and allow collaboration to happen anywhere. 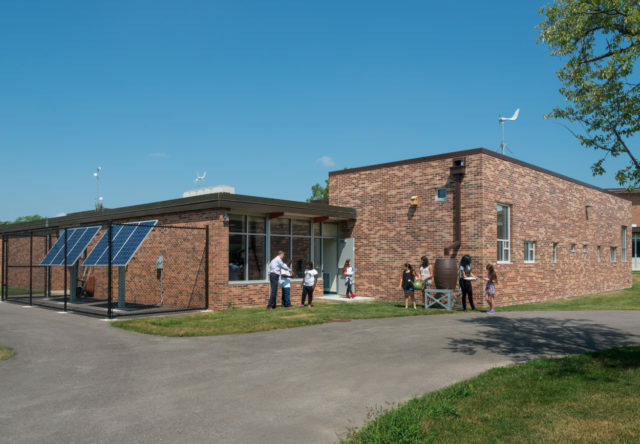 Wind turbines, solar arrays, geothermal systems and other sustainable design elements are used as sources for project-based information and teach valuable lessons about sustainability. 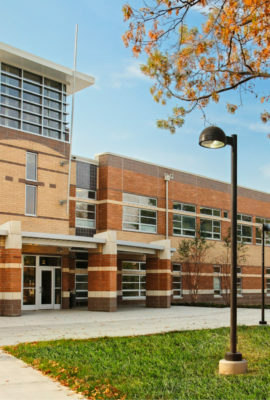 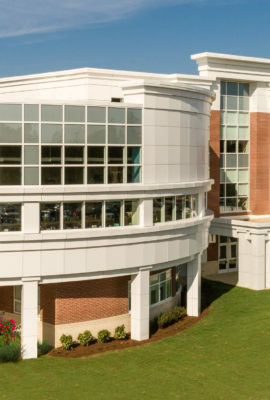 The science wing is separately metered from the rest of the building so that students can track energy and energy generation by all systems. 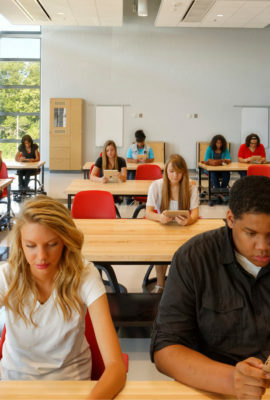 They can access the data through energy dashboards. 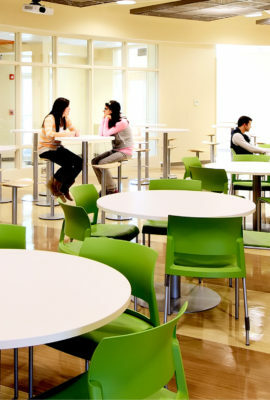 The possibilities are going to be endless. 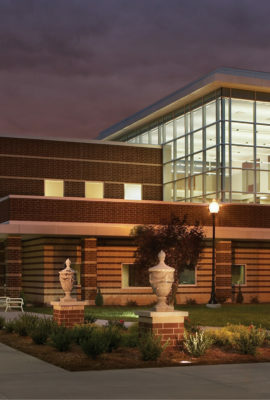 I’m just really excited for the things we can do in the future here.